Boxwoods have so many pests it’s a wonder we continue to grow them. On top of boxwood mites, psyllids, and leafminers, boxwood blight has been spreading since 2011. Boxwoods are special though so we work to protect them from each new threat. 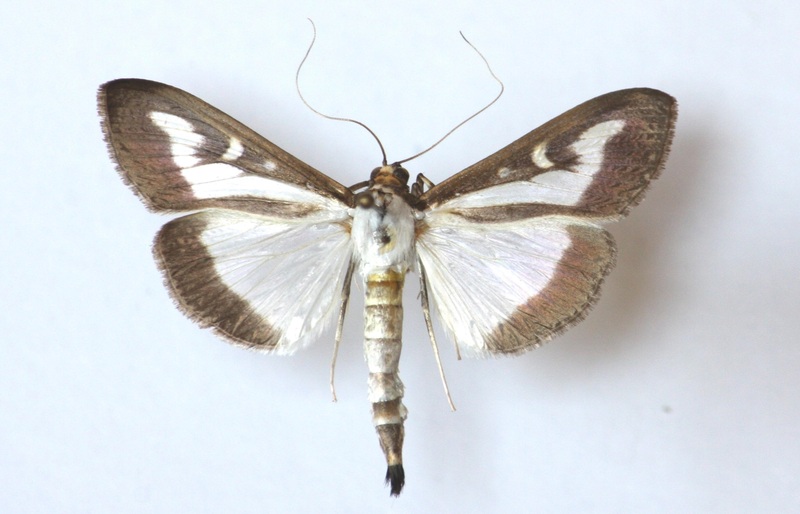 That work will get harder if box tree moth gets established in North America. The box tree moth, Cydalima perspectalis, feeds on boxwoods (Buxus spp.). It is native to China, Korea, and other parts of Asia but was recently found at a couple of sites in Ontario, Canada. So far just the brown and white moths have been found. It remains to be seen if they laid enough eggs in enough places to initiate a lasting infestation. Box tree moth was introduced into Europe in 2007 and rapidly spread across the continent so its damage is well-documented. The caterpillars are yellow to lime green with dark stripes. They eat boxwood leaves and can quickly defoliate and even kill large hedges. In addition to feeding damage the caterpillars create a mess of webbing and frass within plants which is unsightly and protects them from predators. 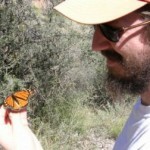 So far no box tree moths or caterpillars have been found in the US. However, the moths can fly over two miles so it would not be hard for them to get from Ontario to Northeastern states. And of course they do not need to fly here. 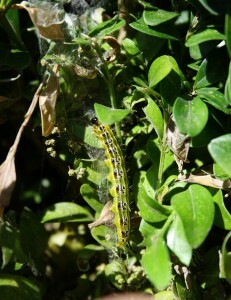 Box tree moths or caterpillars could easily travel on people or plants or in cars (driven by people) across the border. For now public garden personnel, landscape and nursery professionals, extension personnel, diagnosticians, and the public need to be aware of this pest and look for it. The first Canadian sighting was made by a citizen scientist who uploaded a picture to iNaturalist. Box tree moth pheromone lures and traps are commercially available. It would be valuable to monitor with these to aid in early detection. No other pest in the US will defoliate boxwoods so the damage and webbing are easy to identify and distinguish from other causes.